Symphonic Watercolours – Performance Tomorrow Night! 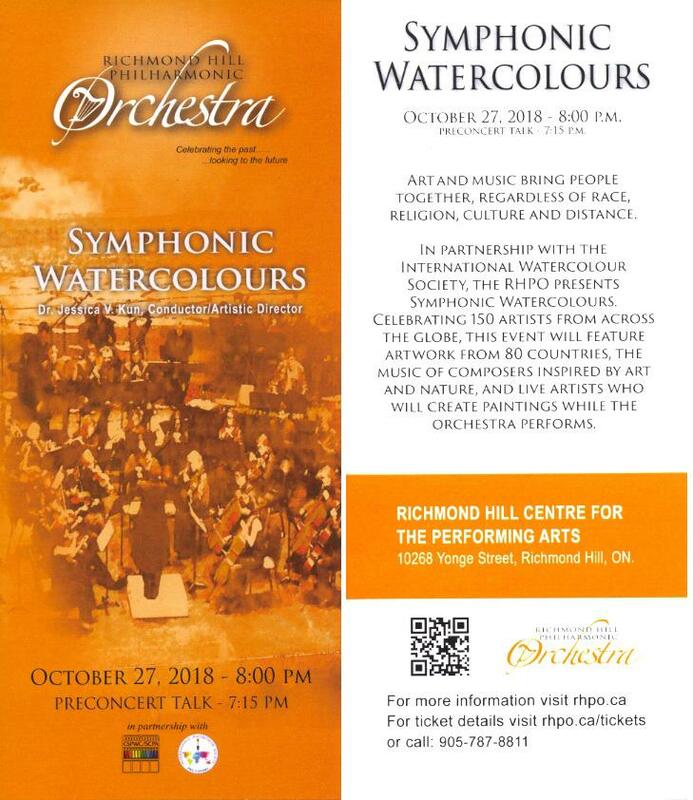 Over 150 of our finalists’ watercolours from over 80 countries around the world have been selected from both our ‘A Symphony in Watercolour’ and our ‘150 Ways to Celebrate’ Exhibitions and will be projected on a huge screen behind the Richmond Hill Philharmonic Orchestra as they play a selection of music inspired by art and nature, which embraces cultural diversity. We will also have two master artists Andy Sookrah and Bonnie Steinberg interpreting the music live as we listen and watch. It is an evening not to be missed! Art and music bring people together regardless of race, religion, culture, or distance. Let’s embrace that together! Previous PostPrevious Exhibition Catalogue Available to Everyone!